"My iPhone XS has been stuck on the black loading screen with the white loading circle all night. I have tried to restart it but it's not responding?" When an iPhone is stuck on the black loading screen or infinite loading screen, it can be almost impossible to use the device and also nearly impossible to fix it. As frustrating as this problem can be, you should be aware that it is not all that rare. This article will present some of the most effective ways to fix an iPhone that is stuck on the black loading screen/Apple logo/reset stuck. Why Is My iPhone Freezing on Loading Screen? For the iPhone X: Press and hold the Side and one of the Volume buttons until the slider appears. Drag it to turn the device off and then press and hold the Side button until you see the Apple Logo. For iPhone 8 and earlier: Press and hold the Top (or Side) button on the device until you see the slider. Drag it to turn of the device and then press and hold the same button until the Apple Logo appears on the screen. Step 1: Open ReiBoot and then connect your iPhone to the computer via USB cable. The program will detect the device immediately. Choose "Repair Operating System" from the main interface. Step 2: Tap on "Start Repair" option and then download the required firmware package online for your device. The downloading process will begin once you click on Download. Step 3: Tap on "Repair Now" as soon as the download is completed. The software will start repairing iPhone system and you'll be able to set up iPhone as new after the process, all the data will be kept. Step 1: Open iTunes on your computer and then connect one end of the USB cable to the computer. Step 2: Press and hold the Volume button (Home button for iPhone 6 and older) on the device for a few seconds. While holding the volume button connect the other end of the cable to the device. Step 3: Let go of the volume button and you should see the iTunes symbol on the iPhone screen. Step 4: iTunes will automatically detect a device in recovery mode. Click on "OK" to restore it and see if this fixes the problem. Step 1: Connect the iPhone to your computer and launch iTunes. Step 2: On the iPhone, press and hold the Sleep/Wake button and the Home button (iPhone 6s and earlier) of the Volume Down button (iPhone 7) at the same time for about 8 seconds. Step 3: Release the Sleep/Wake button after 8 seconds but continue to hold the Home or volume button until you see "iTunes has detected an iPhone in recovery mode." Step 4: Let go of the Home Button or volume button and your iPhone screen should be completely black. If it's, not repeat the process from the beginning. Step 5: Restore the iPhone in iTunes and it should be OK.
For iPhone 8, 8 plus and X, press and quickly release the volume up button and the press and hold the side button until the screen goes black. 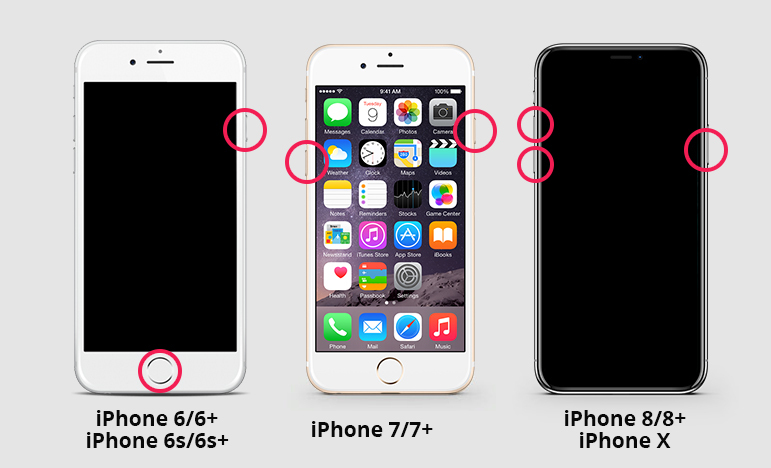 If none of the above solutions worked to fix iPhone black screen loading circle, you may want to consider taking your iPhone to the Apple Store for repair. If the device is still under warranty protection, it can be fixed for free. Ensure you make an appointment early enough to prevent long waits. Your device can malfunction in various ways when the iOS version you are using is unstable. When an iPhone is stuck on the loading screen immediately after an iOS update, it is possible that the update is causing the issue. Hardware problems can also be to blame. If your device has suffered water damage or a hardware component is broken, its functionality may be seriously degraded resulting in certain problems like this one. Perhaps the most common reason why your device is stuck on the loading screen is a malware attack. Malware and viruses can mess with your device's settings and cause this and many other errors. Conflicts in the iPhone's booting settings can also interfere with the iPhone's ability to function correctly, thereby causing this problem. One of the solutions listed above should work to fix an iPhone X/8 (Plus)/7 (Plus)/6s/6, iPad or iPod touch that is stuck on the black loading symbol screen. Let us know if your device has been fixed in the comments section below.